Shakespeare Like You've Never Seen It! National and Local Reviews and Articles for concerts and theaters. Currently in America paranoia reigns, fear persists, and we face a world that sometimes feels it may break apart at its economic and political seams at any moment. So what does theatre, or Shakespeare for that matter, have to offer us? Our hope is that somehow there is still a place for art and music in all our lives. And theatre, as long as it evolves and grows, becomes a vital part of any community and can help us find our way in the world. 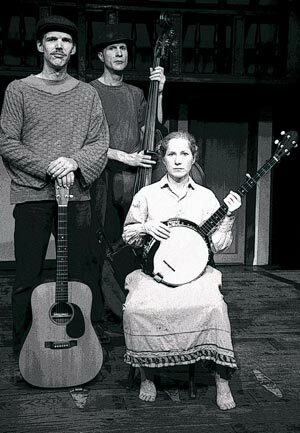 "An Appalachian Twelfth Night" is a story of love, loss, chaos, laughter and music. We hope that this 300 year old poetry can become fresh and thrilling, that it can bridge time and bring diverse peoples to a universal understanding. Not to mention having some good foot-stompin' fun. Don't miss your opportunity to book this exciting new show. Contact Benita Scheckel at benita@maestro.ws for booking information. "Rev. 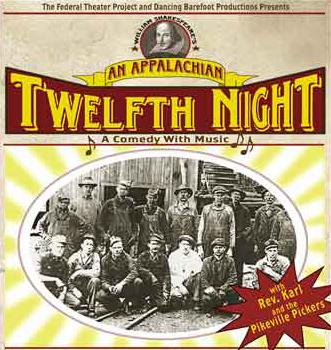 Karl and The Pikeville Pickers"
Please visit the website for An Appalachian Twelfth Night. Copyright © 2005 [The Maestro Group]. All rights reserved. L.A. Theater Reviews, Los Angeles Theater, Los Angeles Theatre, Theater Reviews, Theater LA, Theater Los Angeles, Concert Reviews Los Angeles, California Concert Theater Plays Musicals Los Angeles, Opera, Ballet, Los Angeles Ballet, Los Angeles Opera, Opera Companies, Theater Companies New York, Theater Companies Los Angeles, Theater, Dance, Music Reviews Los Angeles, California, New York, Theater Salt Lake City, San Francisco Theater, San Francisco Opera, Discounted Theater Tickets, Theater Discounts, Theatre Discounts, 1/2 Price Tickets, Los Angeles Theater Discounts, Cheap Theater Tickets Los Angeles, Cheap Concert Tickets Los Angeles, Cheap Tickets Los Angeles, Los Angeles Theater cheap tickets.